Biercamp Brats – We tried a new flavor: Gouda Portobello. 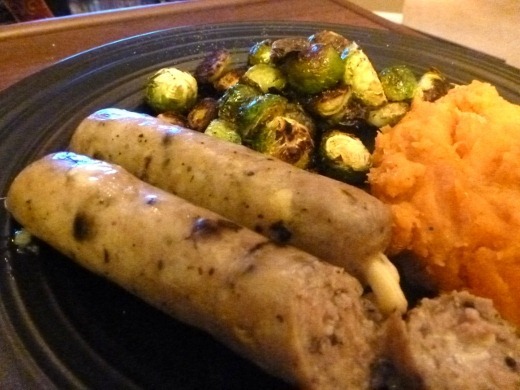 These were amazing and are probably my second favorite Biercamp brat, second only to Jalapeno Pepperjack, of course! The melty gouda tasted incredible and was abundant, and paired well with the earthy mushroom component of the brats. Roasted Brussels Sprouts & Homemade Mashed Sweet Potatoes are two of my favorite easy and healthy sides. 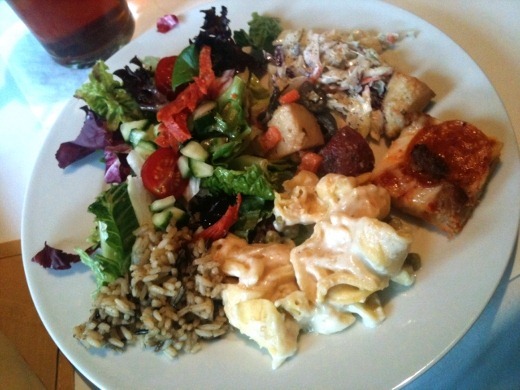 Paesano’s Holiday Lunch Buffet – I treated myself to a nice lunch on my last day of work before the New Year. It was delish! The buffet was filled with salad, soup, coleslaw, pasta and potato salads, pizza, stuffed cabbage, ravioli, lasagna, and a chicken dish. The veggie lasagna was my favorite part. 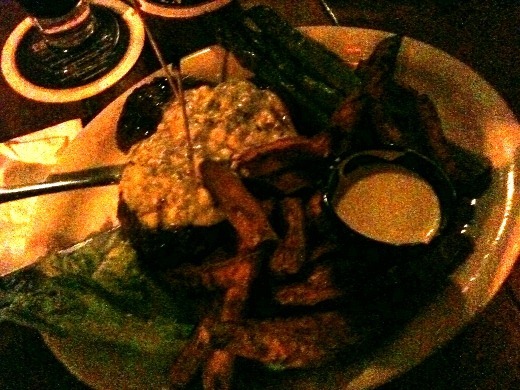 Gorgonzola Tenderloin from Sidetrack. I’ve been wanting to try this dish at Sidetrack, for, well, a couple of years at least. Finally I took the plunge and ordered it. I received a surprisingly large (probably 8-10 oz) cut of beef, slathered in a tangy gorgonzola sauce which was incredible. I typically order my beef medium-well, but recently I’ve started ordering it “medium” which is what I did this night, and I was glad I did! It was cooked probably somewhere between medium and medium-well which was perfect for me. On the side I had asparagus, sweet potato fries, and Short’s Black Cherry Porter to drink. Loved this meal! Oh, and what value – just $12.95 for this plate. One might easily pay triple for such quality food on Main Street in Ann Arbor. And this is just as good, if not better. Sidetrack, just marry me already. 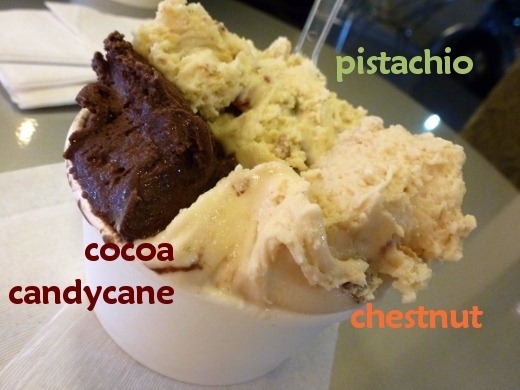 Iorio’s Gelato. Cannot stop craving this stuff. Had to get holiday flavors this week. Pingback: Second Annual Paesano’s Buffet Pilgrimage « Meg.Goes.Nom.Nom.